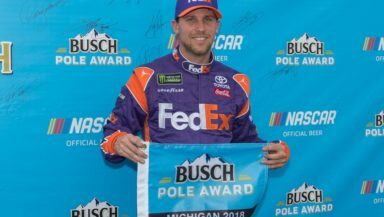 Denny Hamlin wins Busch Pole Award at Michigan International Speedway on Aug. 10, 2018. Photo by Tim Jarrold for SpeedwayMedia.com. Denny Hamlin led all rounds of qualifying Friday evening at Michigan International Speedway to score his 28th career Monster Energy NASCAR Cup Series pole and his first at the 2-mile track. He posted a final-round lap speed of 202.794 mph in his No. 11 Joe Gibbs Racing Toyota and will lead the field to green in Sunday’s Consumers Energy 400. Teammate Kyle Busch will join Hamlin on the front row, qualifying second with a 202.731 lap in his No. 18 Toyota. This was the second time Hamlin and Busch have started 1-2 mirroring last week’s front row at Watkins Glen International. Kevin Harvick qualified third followed by Erik Jones in fourth. Richard Childress Racing’s Austin Dillon and Ryan Newman will start fifth and sixth while Martin Truex Jr., Ryan Blaney, Joey Logano and Alex Bowman round out the top 10. Bowman was the only Hendrick Motorsports driver to advance to the final round. Teammates, Jimmie Johnson, William Byron and Chase Elliott will start 19th, 20th, and 21st, respectively. Daniel Suarez, who was third fastest in the first Cup Series practice, was unable to post a time after getting loose in the first round of qualifying in Turn 2 and hitting the outside wall. He will start from the back of the field Sunday. Follow @angiecampbell_ for the latest NASCAR news and feature stories.